Stephanie Stella Rodgers - Edmonton's Burial & Cremation Professionals | Trinity Funeral Home Ltd.
With profound sadness we announce the passing of our angel, Stephanie Stella Rodgers, on November 24, 2017. She leaves to cherish her memory her son Darrell, her sister Alice (Jack), her brother Andy (Lena), friend John Harboway and numerous nieces nephews. 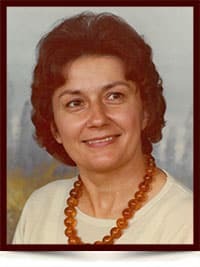 She was predeceased by her parents Dmytro and Justina Sawka; daughter Debra; sisters Mary and Ruth; brothers Bill, Walter and John. Stella was a joyous free spirit. She had a warm, kind, magnetic personality, devoted to family and friends. She was dearly loved by all who knew her. Her love and compassion extended to sheltering abandoned animals. We are very grateful for the kind, comforting care and support provided by the amazing, dedicated staff at Station 31 RAH who went beyond the call of duty caring for Stella. There will be no formal funeral, but a family memorial will be held at a later date. We are saddened to hear of Stella’s passing. Stella was a very loving and caring mother, sister and friend. Our thoughts and prayers are with the family and those who were very close to Stella.